What is a unicompartmental or partial knee replacement? Unicompartmental replacement or uni replacement, is an alternative to traditional knee replacement. It is appropriate for patients that have only one side or compartment of their knee worn out. These patients will have very specific pain on the inside or outside of their knees and little to no pain while climbing stairs. About 30% of our patients are good candidates for uni or partial replacement. Because the parts are much smaller, we are able to retain almost all the native bone and all the ligaments during the procedure. 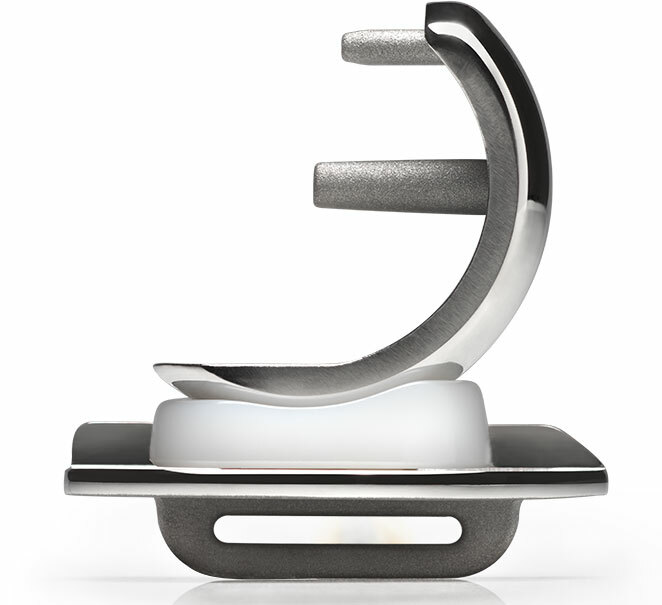 This allows a truly minimally invasive knee replacement. There is very little chance of significant bleeding or dangerous blood clots and a much smaller incision can be used. The recovery time is shorter and rehab is much easier. There is rarely much difficulty getting the knee's natural motion back after surgery. Because the whole knee isn't replaced, the natural knee can continue to wear in some patients. Because we have less long term experience with uni knees, we don't know if they will last as long as total knee replacements. If a uni knee is unsuccessful or wears out, it can be converted to a total knee replacement without the need for extensive revision surgery.